Hamilton didn't get too creative with colored dials. Most dials have a silver butler finish, a white finish, or a two-tone white and silver butler finish. There are a few models with gold-colored dials and there are quite a few models with black dials too. Black dials are often preferred over non-black dials. In the 1950's there were a bunch of models with black dialed variations. If you wanted to have a complete collection of all the various permutations of case materials and dial colors, you would have your work cut out for you. There are lots of models with white or yellow cases and black or silver dials. One of the more straightforward models is the 1959 Lakeland. It was made for three years. 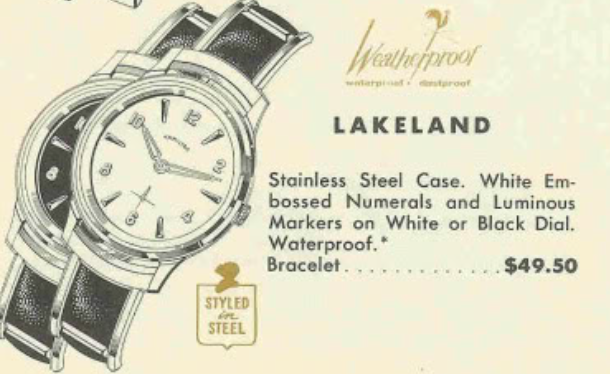 The Lakeland came in a stainless steel case with either a white dial or a black dial. 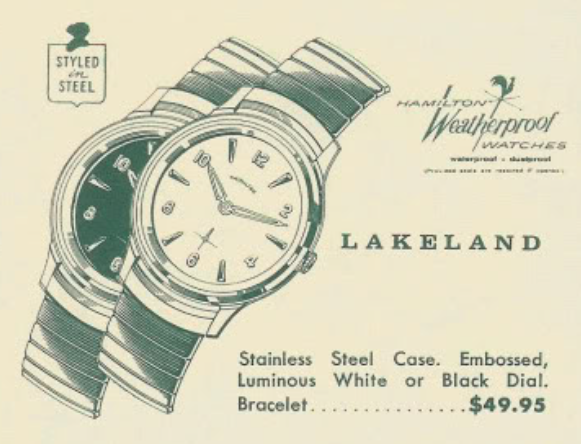 The Lakeland was an entry-level model wth a price point to compete with other quality imported models from Elgin, Waltham and the like. Although it was an entry level watch and priced at $49.50, that doesn't mean it was inexpensive. That would be the equivalent of about $400 in today's dollars. The Lakeland has a two-piece snap together case and a Swiss-made 673 movement inside. It was offered only on a bracelet. In 1960 the bracelet was changed though - so if you wanted all the versions of the model you'd need to find four different variations. My Lakeland project watch arrived with a loose crystal that was also cracked. The lume from the hands was missing so it made it a little hard to see the hands on the black dial. The crown is an obvious replacement and not a very nice looking one at that. It doesn't quite fit right, either. This style of case back can sometimes be a challenge to open and to close. Often it can be hard to open and then when you try to close it, it will be too loose. Hopefully this one won't give me any trouble. Without the bezel in place you can see the dial is textured and this one has a very faded appearance. This case requires a two-piece stem - so it's sort of like a front-loader but not. This watch requires a reflector ring inside the crystal to support the movement from flopping around. It took some wiggling but I eventually was able to get a peek at the joint of the two-piece stem so I could align the stem and swing the movement out without risking breaking the female side. This movement shows a bit of corrosion, probably from the cracked crystal and the poorly fitted crown. Everything is cleaned and dried. I installed a new crystal while every thing was in the ultrasonic. The 17 jewel 673 movement is very straightforward and easy to put back together. It's hard to tell in this photo but the watch is ticking away nicely. Timing wise everything looks great. I can slow it down with a minor tweak of the regulator. There... that should do it for now. I relumed the dial and hands and treated the dial to a "poor man's refinish" and the results look fantastic. I also installed a more appropriate and properly fitting crown. A nice black strap complements the watch nicely and this Lakeland is ready for some wrist time. Dan, what a great job! It looks like a new watch now--but then I guess that's typical of your work. You're the Haydn of Hamiltons, the Bach of the balance wheel. Another piece of American craftsmanship saved!